What type of degree programme should you choose? Difference in content and subjects. 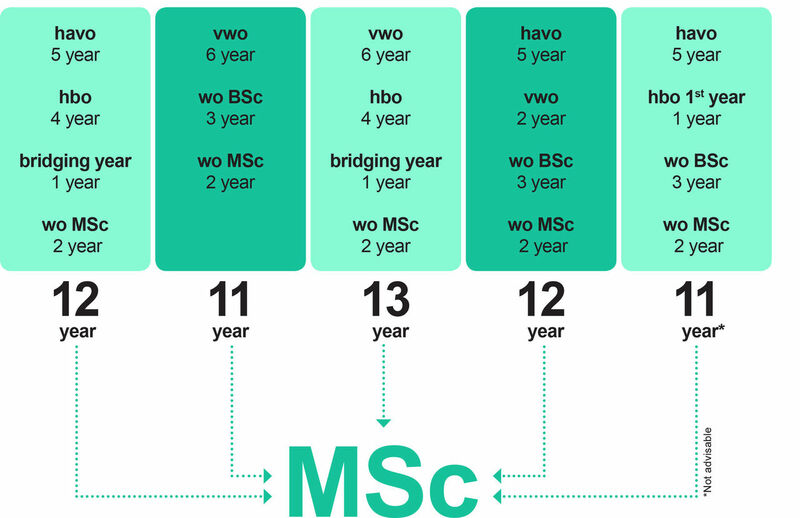 How is your degree programme structured? What paths are possible and what title do I receive? HBO degree programmes have a professional orientation. WO degree programmes have an academic orientation. HBO Bachelor's programmes take four years (240 ECTS). WO Bachelor's programmes take three years (180 ECTS). The minimum admissions requirement for an HBO Bachelor's programme is a diploma at Dutch MBO level 4 (senior secondary vocational education) or Dutch HAVO (higher general secondary education). For WO Bachelor's programmes, this is a diploma at Dutch VWO level (pre-university secondary education) or an HBO first-year diploma. HBO Bachelor's degrees do not give automatic access to a related Master's programme at a Dutch academic university. It is sometimes possible to follow a bridging programme at an academic university to help make up for shortcomings in knowledge and skills. Other than the distinction in levels, the biggest difference between a university of applied sciences and an academic university is the degree of independence. An HBO programme provides much more direction in helping students to make certain choices and for this various means are provided. Students at an academic university are left very much to their own devices to choose their own path. HBO programmes are usually set out in advance, whereas an academic programme can, at least in part, be self-defined. There are, of course, compulsory subjects, but these are directly relevant to the specific academic field that is chosen. If these subjects do not match your area of interest, you should ask yourself whether you have made the right choice. Lectures and tutorials at an academic university differ from those at a university of applied sciences. Both lectures (theory) and tutorials (application) have a different form. In HBO education, there is no explicit distinction between lectures and tutorials, and the two are often integrated. At an academic university, on the other hand, there is a strict distinction between a tutorial and a lecture and not every course has tutorials. Lectures are taken with all the students who need to pass the course, so therefore with multiple classes at the same time, together with students resitting the course and those from other programmes taking the course as an elective. This could result in hundreds of students attending a single lecture. It also often means that there is less opportunity for interaction and that it mainly involves listening. The difference in level is reflected in the number of titles that are available from an academic university compared with a university of applied sciences. HBO graduates can be awarded two titles: Baccalaureus (bc.) and Ingenieur (ing.). A Baccalaureus (Bachelor) is awarded after finishing a university of applied sciences in a non-technical or non-scientific subject. This title is not often used by graduates. Ingenieur (ing) is used more often. This title is awarded to graduates in a technical or scientific subject. At an academic university, many more titles are awarded: Bachelor of Arts (BA), Bachelor of Science (BSc) and Bachelor of Laws (LLB); these titles are also awarded at a higher level. Master's degrees include: Master of Arts (MA), Master of Laws (LLM) and Master of Science (MSc). The PhD title (Doctor of Philosophy) or the title of Doctor is awarded on completion of a number of years of doctoral research and successful defence of a doctoral thesis.